Goshō Jinja Reisai (五所神社例祭?) at Goshō Jinja: The faithful carry a portable shrine ( a mikoshi) on Zaimokuza's streets. 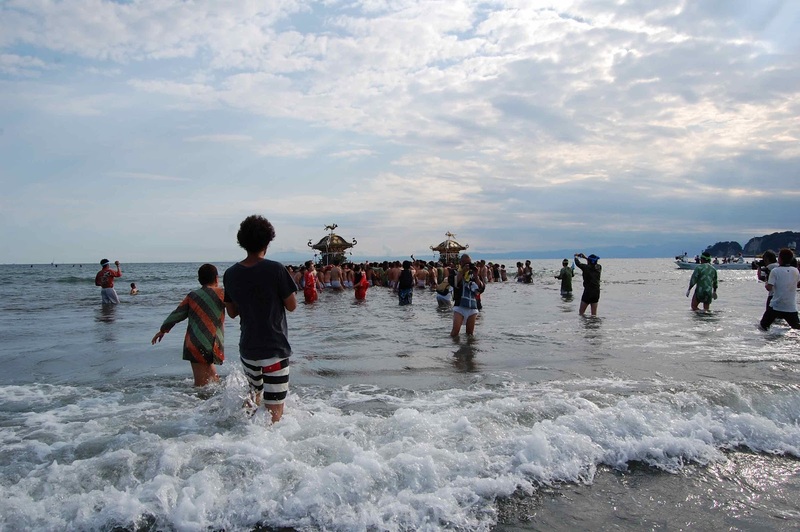 At about 3:00 PM the mikoshi is carried into the sea at Zaimokuza Beach. We arrived at Kamakura Station and a photographer was taking a photo of a black and white poster. 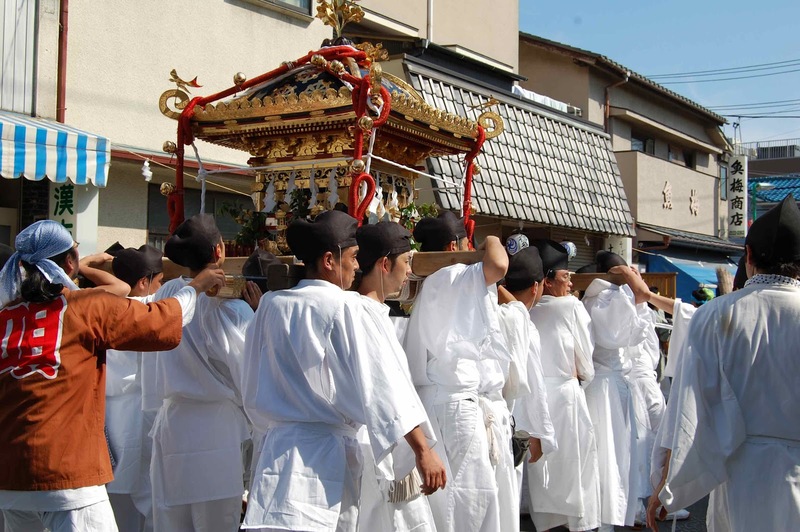 On the poster, large shrines were floating in the waves of the sea. It looked very old, and I assumed it was a museum exhibition. I was very interested, but a museum wasn't possible. Our day's exploits were about seeing this charming beach city. 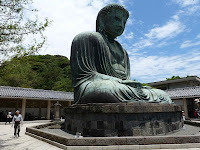 We visited the Dai Butsu En (Large Buddha) and HaseDera Temple, and worked our way down the touristique streets to the sea. The day was beautiful, sunny, warm- the only day without rain in the last 2 weeks. The beach was perfect, our feet were sore, we immersed them in the sands and warm waters. Around 2pm, hungry and tired, we stumbled on this little cafe just off the beach. Lukas had, of course, been craving his coffee, and I, my bread, and here it was. 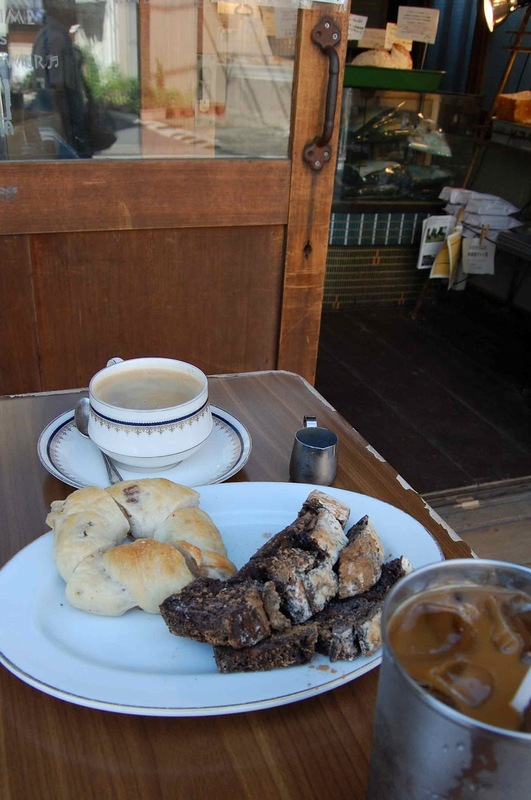 The best coffee we've ever tasted and possibly the tastiest bread. Cost was very high. But they had a sign posted which, I think, said, "The quality is high so please don't question our prices." We enjoyed it thoroughly as a respite: a moment of shade, beach breezes and perfect taste. 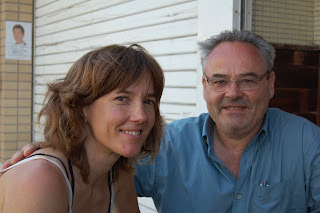 A handsome moment for a handsome couple on vacation in a little beach town. Oh, the good sweet life. 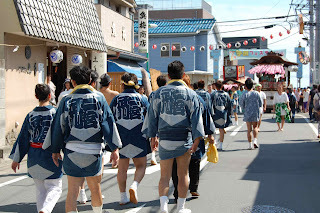 People in "happi" and "tabi" (summer festival wear) began coming down the street. 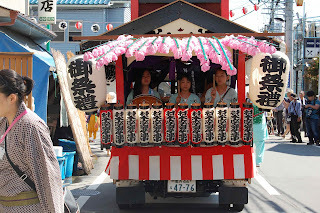 A portable shrine decked out in samurai regalia and florescent pink flower garlands, carrying drum-pounding pre-teens, passed us. 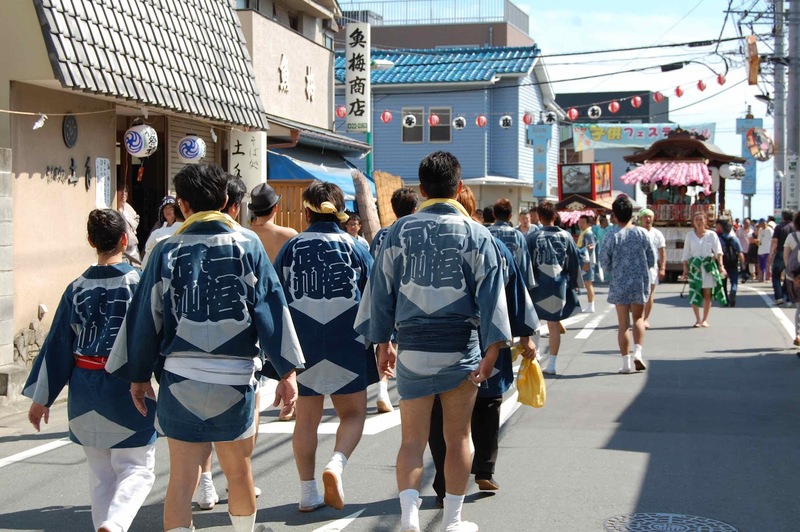 Drunken men wearing sumo-type thongs trickled by. 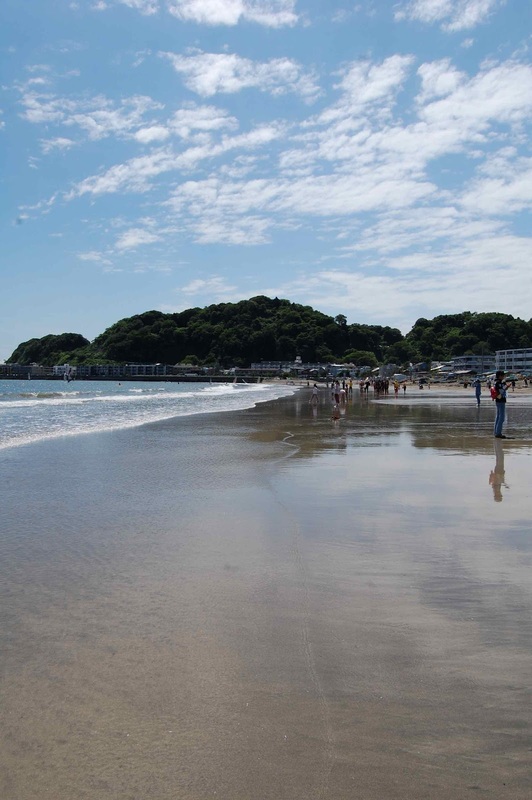 Two men came from the beach wearing nothing but seaweed. Crews of old men photographers gathered beside us. Asked to take our photo. We crunched our bread and sipped our coffee, starting to wonder what was happening. 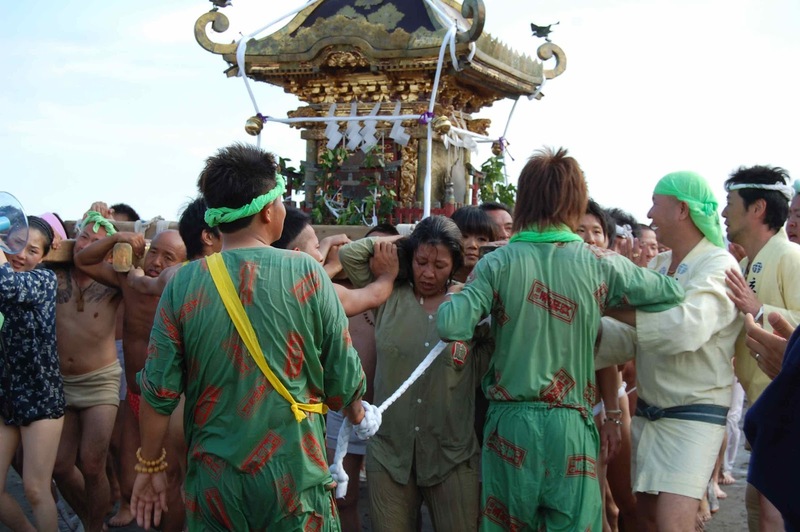 As the drums continued to pound out a rhythm, over the next half hour, large shrines carried by 40 men and women heaving and chanting, chanting and heaving, pulled and oriented by large thick rope-pullers, passed us by. 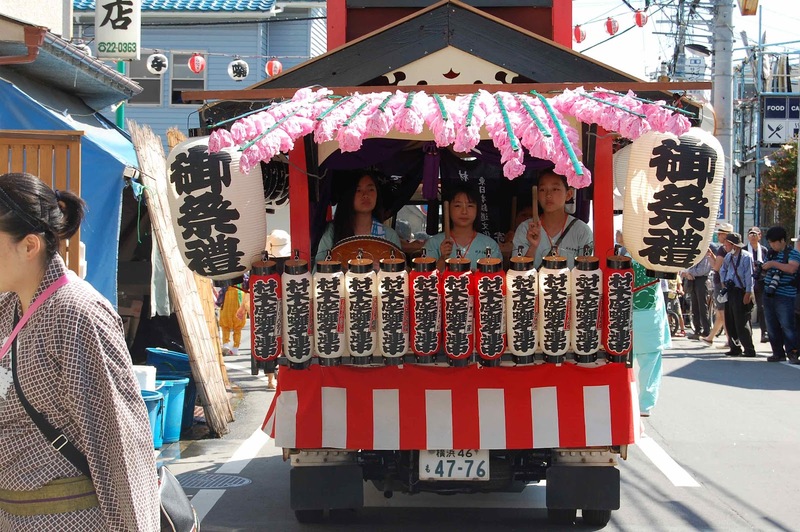 What kind of luck, to see a festival pass us by. 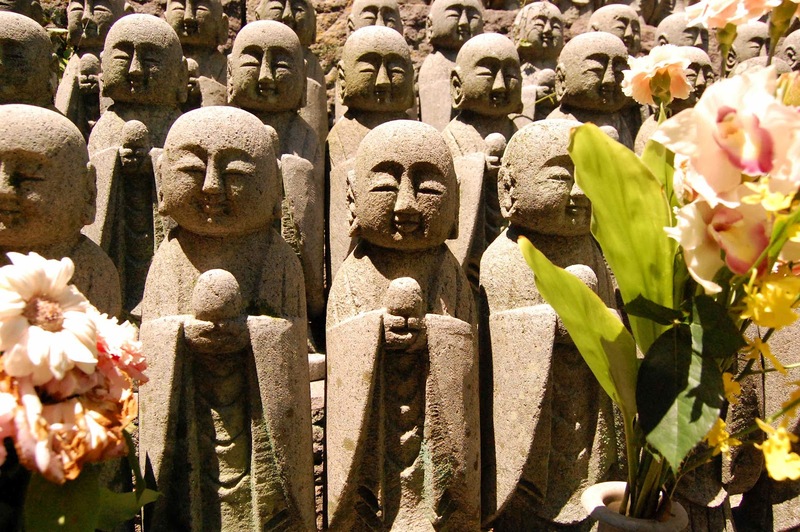 The shrines were headed for the ocean. As these kindly police officers told us, the townspeople take the gods from the temple to the sea once a year, to let them bathe in the sea. What struck me most profoundly is this: It took many neighborhood teams taking turns, each turn of 40 or 50 men and women, to carry these heavy, sacred, old and profusely decorated shrines down to the sea and back. I was brought to tears by the community effort it took. It took many many people, all working together, huffing and puffing. 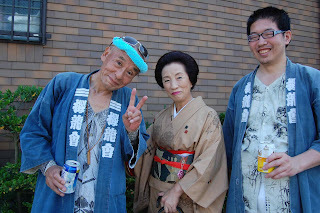 And laughing and really goofing it off and drinking sake and beer. They must do it this way to get all these people excited and doing this, together, year after year after year. And as I watched 2 shrine carriers fall in the crush of the waves and wood, disappearing into the ocean, I gasped. I scanned the water searching for them. I wondered if they would return from the sea. Wow how lucky you were to be there right then!!! 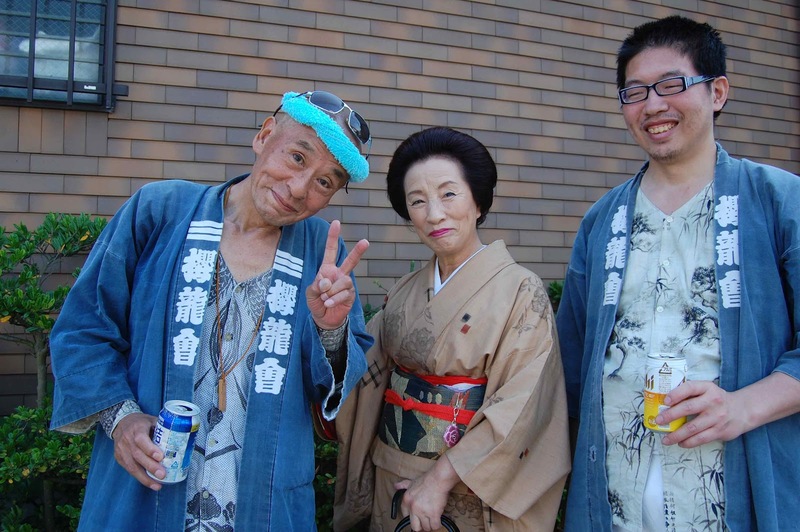 Now any chances of seeing you in Yamagata? How long are you around for? I have car, will drive ; ) Call me, mail me, contact me!!! 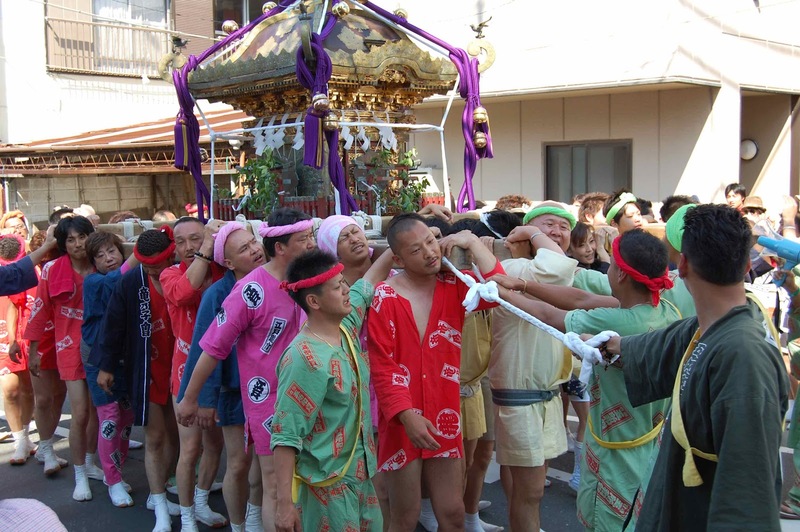 090-9035-5177 As for community, Hitoshi does all these omikoshi events, shrine and temple gatherings....sometimes it drives me mad, but it really is a special time which will hopefully continue, Hitoshi loves it.